The sense of historical concern is considered to be one of the peculiarities of each nation. The existence of nations or people depends on the historic memory which is exactly in correspondence with time and place. Historic memory or the sense of concern shows the nation’s place in the world culture and civilization as well as defines its role in the world arena. For this reason, there are always arguments about the birthplace of universal civilization between The East and The West. It is natural that there are these kinds of disputes between the two poles of the world. However, taking the control over others’ interests and ideologies, violating and using them for the benefit of one’s own have flared up in the past years. We think that it would be true to define it with the notion of frequently -used word “dogmatism”. We are used to showing ideological standard -bearers of IGIL and “Al-Qoida” as dogmatists. They never hide their hostility towards us and are armed against us. Those who pretend to take control of our history, especially, who want to occupy Samarkand and Bukhara that are the centers of culture or historians who are distorting the history about historical traditions and ethos can be examples of dogmatists. These dogmatists have speculated upon other nations in their books, particularly, our history within their own benefits. The whole world recognizes Zakhiriddin Mohamed Babur to be one of the Temurids while Westerners recognize his whole empire as The Mongolian Empire. You are compelled to call it to be dogmatism if they argue that they consider Farobiy and Avicenna that were true pillars of the Renaissance of the Medieval to be Arabs. Our ancestors who lived in the past are considered to be the spiritual stars of mankind. As well as being our ancestors they are regarded to be majestic images to the whole world. But distorting true history is betrayal of the whole world. And today they are recording their treacherous claims to the cinefilms. Of course, not all can have the opportunity to read the books where their baseless claims have been written. Besides, there is no need for it. That is why they are using the cinema to have a strong influence on people’s consciousness. 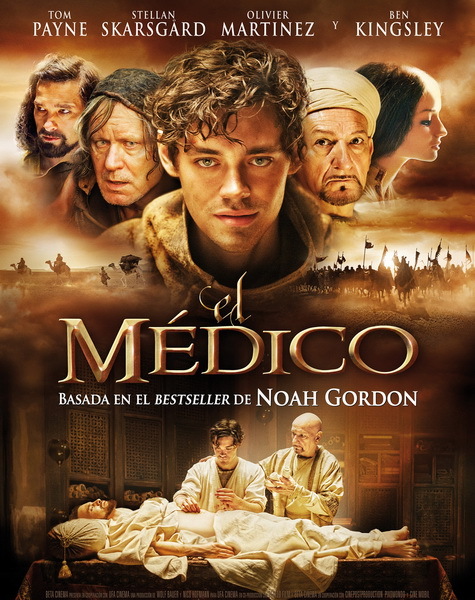 We can take the film “The Physician” released by the German cinematographs on 25th December of 2013 as an example. The film begins with the scenes of Europe which was bogged down in ignorance of the Medieval. An eleven-year-old Robert Cole’s mother died because of illness. He had a strong desire to take up medicine as a result of this great loss. He wanted to help people treating all kinds of illness. As he was left an orphan he followed a wandering barber healer Barber. And Barber taught Robert whatever he knew. But Robert got interested in the all secrets of medicine not being satisfied with his teacher. One day he heard about famous Avicenna from the Hebrews coming from the East. Thus, Robert headed east hoping to be an apprentice with Avicenna. After many years he was succeeded in being an apprentice with Avicenna coming to Isfahan. Avicenna’s apprentice acquired knowledge about internals secretly cutting the dead bodies. Avicenna changed his views and drafts according to the apprentice’s experience. When the emir of Isfahan became ill, Robert practiced the first surgery process and his master Avicenna assisted him. At the end of the film Avicenna attempted suicide drinking poison. But Robert continued his research coming back to Europe. The brief content of the film is this. Isn’t it a blatant distortion of the historical truth even for a schoolboy who does not know the history of Uzbekistan? Avicenna, an encyclopedic scientist, is considered to be our great ancestor who practiced nearly all the sciences of his time who was born in Bukhara in 980. The term “medicine” came to light because of this scientist. Even the developed world medicine owes much to this person. And if that’s the case, why should the historical truth that is related to this scientist be distorted? Why should Avicenna assist Robert Cole in practicing medicine? Avicenna is considered to be our compatriot as well as great scientist pertinent to the whole world. Why should the history related to this person be distorted? There are a lot of questions which are left unanswered. Simply this might an ordinary film for whomever. But it should be born in mind that these attempts are nothing but ideological threats against our history. What are the extremist essences of these ideological threats? We shall have a better understanding about dogmatists who attack on our history if we ponder over this question. The film was shot based on the screenplay created on the basis of the novel “Avicenna’s apprentice” by an American writer Noy Gordon. The plot of the novel differs greatly from the events of the film. We are far from speaking about it. The novelist attempts to prove how much the Hebrew nation contributed to the history of medicine and development of science in the Medieval in his works. This can be seen from the fact that at the very centre of the film the Hebrew took the important role. What made Noy Gordon uphold his baseless claim for the sake of the Hebrews and Europe? Maybe it is love to his country. Is that really so that one should express his love to his land for the sake of offending the history of other nations? There is another thing worth being mentioned. There are several films about famous men from American and European continent in the world cinematography. It is true that they have already done what they hoped the would. Thus, there are a lot of films on Western culture frequently shown in our national channels. And their novels and heritage have been translated into Uzbek and are still being done. This serves to strengthen the cultural relations among nations as a positive phenomenon. Writers like Noy Gordon and those who shot films based on his novels are dogmatists who threaten the relations among nations. They never stop threatening and changing the historic truth that are acknowledged widely for their own benefit. What terrifies mostly is that the authority of the fund “Ibn Sino” has not taken any step since the film was released about a year ago. They have not sent any letters of complaint to Noy Gordon and those who created the film. Is it indifference or acceptance their position on Ibn Sino? Of course, their letter of complaint can not ban the release of the film but the actual truth on Ibn Sino serves to be a remark on those like Noy Gordon. Besides, it would be a good mention that they do not have any right to distort history. Otherwise, we remain ordinary spectators of distortion of glorious and golden pages about historical people and history. We will not be able to preserve history that our ancestors kept sacred and undoubtedly be ashamed before the future generation.